Mary Nell Largen Cox, 86, of Snow Camp went home to be with the Lord on Thursday, April 20, 2017. Mary was a born in Carroll County, Virginia and relocated to Trinity, North Carolina with her family in 1945. She was a member of Trinity Worship Center and the Ladies Auxiliary of Gideon's International. 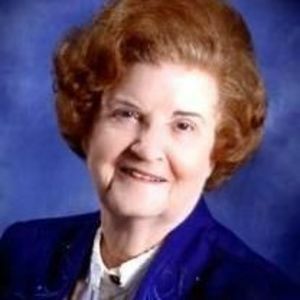 Mary taught children's Sunday School for over 50 years. A funeral service will be held on Saturday, April 22, 2017 at 1:00 p.m. at Trinity Worship Center, 3157 S. Church Street, Burlington officiated by Pastors Darrell Cox and Roger Barefoot. The committal service will be 3:30 p.m. at Floral Garden Memorial Park Chapel Mausoleum, High Point. The family will receive friends on Saturday from 12:00 until 12:45 p.m. at the church. Mary was the daughter of the late Hobart and Stella Mae Ross Largen and was also preceded in death by her son, Curtis Cox; brother, James Largen and sister, Idell Baker. Cherishing her memory is her husband of 67 years, Ernest Clay Cox; daughter, Debra Pendry and husband, Gary; sons, Kenneth Clay Cox and wife, Diane and Neil Cox and wife, Amanda; grandchildren, Shana Atkins and husband, Scott, K. Clay Cox II, Bret Cox and wife, Jessica, Tyler Pendry and Sarah Toelkes, Austin Pendry, Spencer Pendry, and Carson Cox; great-grandchildren, Chandler Atkins, Matthew Cox, Averee Atkins, Ethan Cox and Cabot Atkins and her beloved dogs, Abby and Missy. Memorial contributions may be made to The Gideon's International, PO Box 565, Burlington, NC 27215 or Hospice of Alamance-Caswell, 918 Chapel Hill Road, Burlington, NC 27215. Loflin Funeral Home, Liberty is honored to serve the Cox family.